The wildfire which is causing destruction in the Fort McMurray area of Alberta, Canada, looks set to result in a significant insurance loss, as the number of buildings and properties damaged reaches 1,600 and further impacts are possible with the fire still burning. An estimate of the insured losses has been released by BMO Insurance who said the event could cost as much as C$9 billion, with the low end estimate C$2.9 billion. Officials have said overnight that much of the city of Fort McMurray “could be destroyed” before the current emergency is over, raising the prospects of increasing numbers of structures being damaged. Analysts said that this could become the most costly natural disaster in Canada’s history. Some of the near 90,000 evacuees have been forced to move further away from the city overnight, as the fires continues to move and intensify in some areas. Continued warm weather and strong winds are expected to fan the flames through the rest of the night, but the forecast is for cooler weather later on Thursday which could make fighting the blaze easier. There have been reports overnight of additional oil facility and pipeline shutdowns, which raises the possibility of business interruption losses. The fire extent continues to grow, with estimates saying that it now covers more than 10,000 hectares. The Premier of Alberta Rachel Notley cited the “significant destruction” of the area and that over 1,600 structures are reported to have been destroyed so far in an update at 10.15am local time on May 4th 2016 (17.15pm BST, 12:15pm EST). Currently the wildfire blaze in Fort McMurray is not considered under control, with fears that forecasts of rising winds could result in further impact to residential and built up areas. Certain fronts of the fire are reported to still be extremely active, resulting in a continued evacuation of residents from the region. The evacuation is now reported to total 88,000, the entire population of Fort McMurray. News reports show terrible scenes of evacuees homes and livelihoods being lost and the fire itself still advancing and strengthening in some areas. The scale of the evacuation itself is quite remarkable, the largest in the region’s history, as is the fact that so far thankfully no loss of life has been reported. The current fire extent according to the latest data from Natural Resources Canada can be seen below (click the image for a larger version). 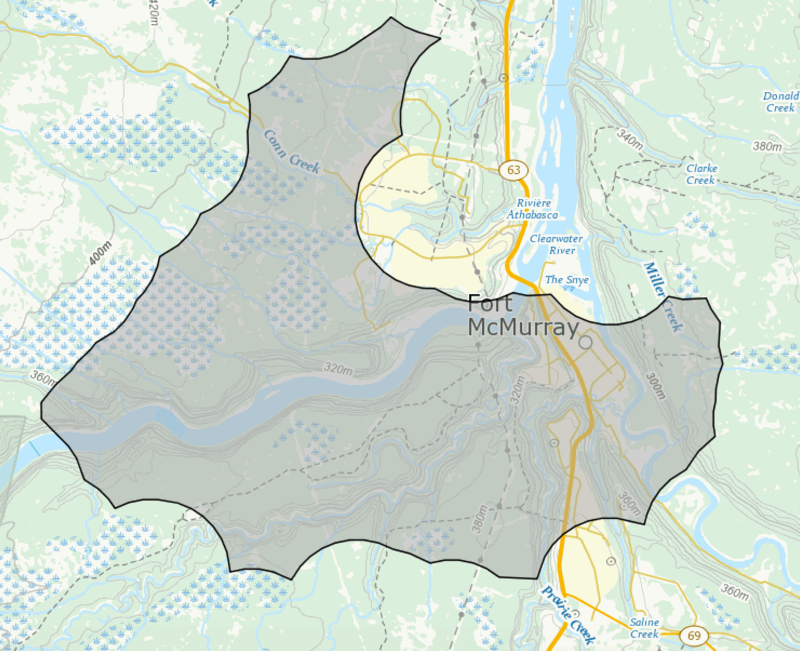 The Fort McMurray area is in the heart of the Alberta oil sands region and property values are known to be high in the area, raising the prospects of larger insurance losses, thus increasing the possibility of some impact to reinsurance companies should the wildfire continue to spread and cause damage. The wildfire, which has been burning since Sunday, is now being compared to the 2011 Slave Lake wildfire, which destroyed an estimated 374 properties in the town, damaging another 52. That fire also destroyed 59 properties in a neighbouring municipality. The Slave Lake wildfire was estimated to have caused an insurance industry loss of C$700 million, which made it Canada’s second most expensive natural disaster at the time. The Alberta floods of 2013 are currently the most expensive insurance and reinsurance industry loss Canada has suffered at as much as US$2 billion. Andrew Siffert, Assistant Vice President and Senior Meteorologist of insurance and reinsurance brokerage BMS Intermediaries Inc., provided some colour on the Fort McMurray wildfire’s potential impact to insurers. “Residential areas that include traditional homes, apartments, townhomes and mobile homes have been most affected, but the media also reports that fast-moving flames have damaged a gas station, a hotels and fast food restaurants along with other businesses. In some neighborhoods, 90% of homes are a total loss. The area is home to a booming oil sands industry and is surrounded by many high-value homes due to higher paying oil jobs. A quick check of home prices shows many valued between 300,000 CAD and 500,000 CAD. By comparison, a 2011 fire in the town of Slave Lake (260 km southwest of Fort McMurrary) impacted only 433 buildings and caused an insurance industry loss of 700 million CAD. Due to the higher number of damaged structures and the higher value of surrounding homes, it would be easy to interpolate that the Fort McMurrary event could surpass the Slave Lake event and top over a billion CAD in insured loss, making it one of the costliest insurance events in Canadian history,” Siffert explained. This current wildfire in Fort McMurray, Alberta looks like it will be a significant loss event (one of the largest in Canada’s history) for the insurance industry, with the potential to cause some insurers to call on reinsurance capital support to pay their claims. High temperatures and dry conditions, following a warm and drier than average winter in the region look set to keep fire danger levels high over the next day or two, with winds likely to fan further fires and spread those already burning. It’s a situation being discussed as among the worst possible combination of inputs to wildfire potential conditions. Tomorrow’s wildfire weather forecast map from Natural Resources Canada shows the extreme fire conditions expected (click the image for a larger version). In terms of residential property damage, the municipality of Wood Buffalo has reported as much as a 90% loss of structures in one area, with 70% and 50% in others, suggesting the fire is causing serious property damage. The fire is said to be moving rapidly and the latest reports suggest that the local airport could be threatened tomorrow, which would also suggest the chance of increasing commercial insurance losses. Siffert of BMS Intermediaries also explained that business interruption (BI) losses could be a factor, given the evacuation of the entire city of Fort McMurray which could suggest that loss of use and other BI claims are possible. “For example the fire has disrupted oil operations in Canada’s oil sands region. While no damage has been reported at the mining sites, Royal Dutch Shell has closed one of its oil sands mines and is in the process of closing another. Suncor Energy stated that it will be reducing crude production. One has to wonder if this has caused oil to increased to today,” Siffert said. Canadian insurance companies are braced for claims with many sending assessors and claims teams to the region as they prepare to assist home and business owners. Just how extensive the insurance industry loss could be is impossible to estimate at this stage, but a number of industry participants Artemis has spoken with all suggested it could stretch into a billion Canadian dollar plus loss. Whether that impacts on reinsurance providers, including any insurance-linked securities (ILS) funds or reinsurance sidecars with exposure to Canadian property risks, is uncertain. However Canadian insurers do tend to make wide use of reinsurance arrangements, as evidenced by events such as the Alberta flooding, recent years winter storms and the Slave Lake fire, all of which were said to have had at least an attritional impact on certain reinsurance contracts. The wildfires are flaring up again this afternoon, highlighting the fact that this is an ongoing catastrophe for the Alberta, Canada region. A raging wildfire in the Canadian city of Fort McMurray has led to the largest evacuation in the history of Alberta province. Nearly 88,000 residents were evacuated on Tuesday and Wednesday as a major wildfire has burned entire neighborhoods, business districts, and a portion of Fort McMurray’s downtown. Preliminary reports suggest that more than 1,600 homes and structures have already been damaged or destroyed. As of this writing at 01:00 UTC May 5, the fire – named the Horse Creek Fire – continues to burn out of control as firefighters are struggling to contain the blaze given gusty winds, well above normal temperatures and low relative humidity levels. The blaze has now charred more than 10,000 hectares (24,710 acres) of land and the fire perimeter was expected to expand through the rest of Wednesday before cooler conditions reach the region on Thursday (May 5). Alberta’s Premier was quoted as saying the event is “the single biggest overall impact on a community in the history of the province.” A provincial state of emergency was declared, including a local emergency in the hardest-hit Regional Municipality of Wood Buffalo. 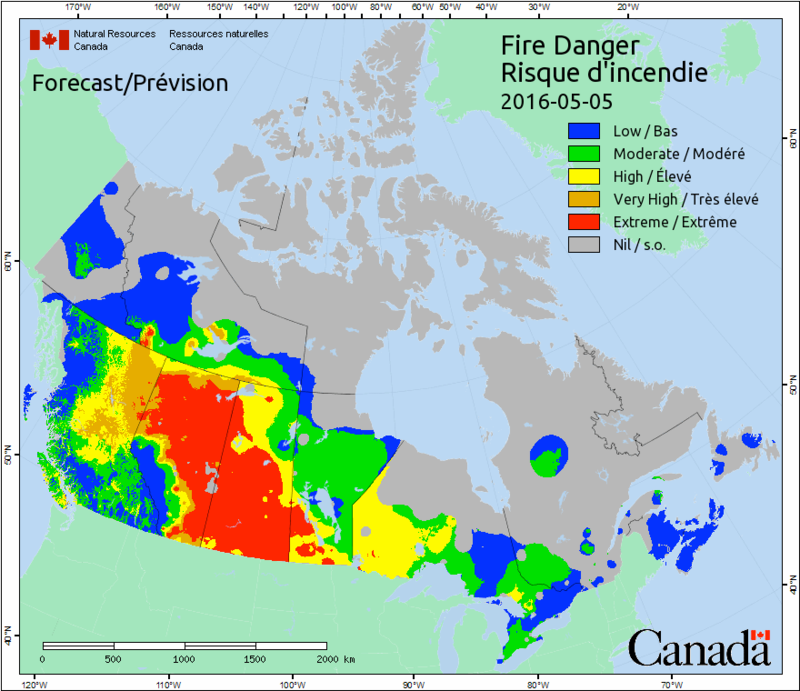 The fire in Fort McMurray was enhanced by the combination of dry soil, above normal temperatures, humidity levels below 30 percent and winds gusting to 72 kph (45 mph). The atmospheric set-up that allowed these conditions to occur was largely attributed to what is known in the meteorological community as an “omega block” given a wavy jet stream pattern that is shaped like the Greek letter Omega. When such a pattern emerges, it is defined by a stalled ridge of high pressure that acts as a block between advancing storm systems. This prohibits the normally expected west-to-east progression of areas of low pressure. As the omega block developed on May 2 and May 3, it allowed substantially warmer-than-normal air to track far northward into northern Alberta. Some areas on May 3 alone were as much as 24°C (43°F) warmer than typically expected at this time of year. Fort McMurray set a daily temperature record of 32.6°C (91°F) on May 3, which beat the previous record by 5°C (9°F). Environment Canada notes that the normal high is 14°C (57°F). The early season nature of the western Canadian wildfires can partially be attributed to the intensity of El Niño during the last several months. Temperatures were above normal during the winter months, which led to a below-average snowpack and brought the arrival of early spring-like conditions. The milder air caused the snowpack to melt much earlier than usual and a lack of precipitation caused soils to dry out and become vulnerable for wildfires. Environment Canada cited that cooler conditions were expected to reach Fort McMurray on May 5, as the omega block breaks and slowly migrates eastward. The cause of the Horse Creek Fire near Fort McMurray currently remains unknown. The rapid spread of the fire on May 3-4 caught many residents by surprise as city officials raced to evacuate all 88,000 residents. Local authorities estimated that 17,000 citizens evacuated north to oil industry sites, while another 35,000 evacuated towards the city of Edmonton. Traffic was bumper-to-bumper on Highway 63 and other major thoroughfares as residents quickly fled Fort McMurray. No fatalities or injuries have been directly linked to the fires at this time. Preliminary assessments indicated that entire neighborhoods were completely destroyed as well as pockets of the downtown area. Numerous businesses also burned as the fire perimeter spread despite 88 firefighters and 22 fire trucks being initially dispersed near the heart of the fire. Officials confirmed that none of the firefighting tactics had been able to stop the growth of the blaze. An initial assessment suggested that 1,600 homes and structures had minimally been damaged or destroyed, with many buildings burned to their foundations in piles of soot. The hardest-hit areas of Fort McMurray were on the city’s south side. Swaths of infrastructure were also heavily damaged. Fort McMurray is a major part of Canada’s oil sands industry, and the fires led to the shutdown of production at multiple oil facilities which were located dozens of kilometers (miles) north of the city. No damage had been reported despite the shutdowns, which included such companies as Royal Dutch Shell Canada, Suncor Energy Inc., Husky Energy Inc. and Inter Pipeline. Alberta oil sands are the third-largest reserves of oil in the world behind Saudi Arabia and Venezuela. Canada’s total oil sands production is roughly two million barrels a day – much of which is exported to the United States. The rapid spread of the fires was also aided by an abundance of boreal forest (such as spruce trees and pine trees) that is very conducive to burning. Given the dry conditions and the availability of significant fuel for the fire(s) to expand, once the fire was ignited and strong wind gusts arrived that tracked it into Fort McMurray, it set the stage for a major and devastating event. Given the ongoing nature of the event, it remains too early to provide a specific economic or insured loss at this time. However, it is expected that once assessments are finalized, the Horse Creek Fire in Fort McMurray will end as one of the costliest natural disasters in Canada’s history. Insurance industry officials in Canada report that home insurance typically provides coverage for property, indoor contents and living expenses incurred by policyholders while being unable to stay at the residence. Businesses are also able to purchase insurance that protects from any lost sales or earnings due to interruption from catastrophe events. The current record for costliest Canadian wildfire was the Slave Lake Fire that damaged or destroyed 522 homes and structures in May 2011. That fire caused more than CAD700 million (USD680 million) in nominal insured losses, and at the time, was the second-costliest event in the history of Canada’s insurance industry. Overall economic losses in the Slave Lake Fire were greater than USD1.0 billion. It is worth noting that the average price of homes in Fort McMurray is much higher than those in Slave Lake. Data from the Fort McMurray Real Estate Board in February 2016 cited that the cost of a single-family home was CAD627,150 (USD487,307). This compares to an average home price of CAD300,000 (USD233,118) in Slave Lake, as per the Slave Lake government.